For a while, I wasn't sure what vegan food to kick off the start of my Foodie Friday blog post for today. However, after careful consideration, I think breakfast is the right choice. You see, for most people that are curious about the vegan diet, they are often confused about what it is that we eat for breakfast. So, vegan breakfast it is and on the familiar side so as not to scare those considering incorporating a vegan diet into their lifestyle. 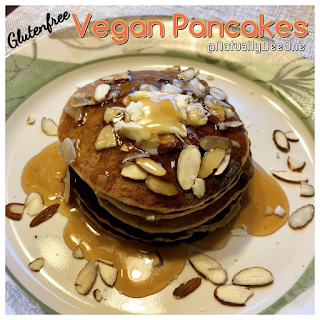 Let's start with a gluten-free option--oats and banana pancakes. Now, some of you guys are already aware from my Instagram and Facebook pages that my kids and I are vegan, but my husband is not. He primarily eats a vegan diet at home because that's what I cook; however, he has other foods at home that he can eat and when we do eat out, he goes back and forth between a vegan meal and a meat meal. That's my family dynamics right now. Initially, he was hoping it was a phase that we were going through, but after some years, he now accepts the fact that we're not switching back to eating animal products. "What about protein?" This is the main question that comes out of the mouth of someone that's not vegan. I can say, I've never asked this question when I wasn't vegan. I actually looked it up because my husband asked me when I said I wanted to become a vegetarian; that was before I found out about veganism. I was a horrible vegetarian anyway because I didn't want to eat eggs or drink cow's milk (milk sensitivity), but I would eat foods that already have those products in them. So, months later after following a black vegan group on Facebook and after finding another lump in my breast, I decided one day that the next day I'll start my vegan diet. I've been vegan ever since. Since I'm not a big cereal eating like my husband and kids, I had to figure out breakfast while I was already a vegan. I enjoy oatmeal, but eating it every day is just too much. It's funny that the first vegan breakfast that I'm sharing with you also has oats. Anyway, it's delicious and you'll enjoy it. Let's get started. This makes 8 regular sized pancakes and has 5 main ingredients. It's glutenfree and oil-free if you decide not to use the coconut oil or vegan butter. In any case, I wanted to give you plenty of options. We usually double this amount for my family of 4; that makes 16 pancakes with each of us getting 4. When doubling, use 1/4 cup for the maple (same as 4 tbsp). Topping options: vegan butter with maple syrup, fruit spread, crushed or chopped fruits, dairy-free whip cream, dairy-free chocolate chips, chocolate syrup, etc. Add 1/2 cup of vegan milk into a high-speed blender, then add the oats, banana, the rest of the vegan milk, and syrup. (If you decide to use the oil, you can add it here.) Blend for 60-90 seconds. Heat the skillet to about 350 degrees or heat up a frying pan. When the top is no longer wet looking, flip the pancakes with the spatula. Basically, cook for about 3 minutes on each side. Remove the pancakes from the skillet or frying pan. Serve with your favorite toppings. If you want a protein boost and a nutty topping, add the crushed nuts on top. That's it! I hope you enjoyed it! If you find this post useful, follow me, comment below and share it on your page. Let me know if you want to see more articles like this one. I have recipes for the basics, like various vegan milk, juices like apple or orange juice, vegan cheese, and much more. Have a wonderful day and thanks for reading! Foodie Fridays will be posted on Fridays. Not all post will be a recipe, but it will be about vegan food. Talk soon.